We all do it, get behind the wheel after a rough night’s sleep and then top ourselves up on caffeine to get through a long day at work. Somewhere in the chaos of all life’s commitments, some of us try to squeeze in that run or quick session at the gym. 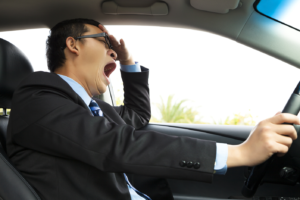 Fatigue is one of the leading causes of road accidents, a fact which is well-known by the majority of drivers. However, being sleep deprived can impact on other areas of our lives and this includes our relationship with food. The evidence suggests that our waistlines are definitely not thanking us. Research from one study discovered that there was a relationship between a lack of sleep and food in take, as well as making bad food choices (Knutson, Spiegel, Penev, & Van Cauter. 2007)¹. The metabolic disturbances identified mean that less than 7hrs sleep has been hindering our sweaty expeditions to a trimmer figure. How does this all work exactly? The pleasure and satisfaction felt when we eat is heightened and this leads to making poorer health choices (Hanlon, Tasali, Leproult, Stuhr, Doncheck, de Wit, . Hillard, Cauter, 2016)². Our endocannabinoid system is responsible for our sense of appetite and regulates our hunger. Lack of sleep can effect this system and the hormone leptin that signals fullness in compromised. Even more interesting is that the study conducted by the University of Chicago compared the food cravings we experience when we’re tired, to the cravings experienced by individuals that use marijuana. So why do we continue to deprive ourselves of those vital 7 hours of sleep? Sleep is seen to be a luxury in our lives and this is simply an attitude which needs to change. Research has identified the number of safety and health risks we face when we do not get enough sleep. When we don’t prioritize those 7 hours of sleep we put ourselves and other drivers at risk when we get behind the wheel, but when we push ourselves to the limit we are also compromising our health and wellbeing . The evidence is clear, sleep is a necessity not a luxury but the rest (literally) is up to us. Start off small, maybe get to bed 15 minutes earlier, your body will thank you for it.